A. E. Housman. 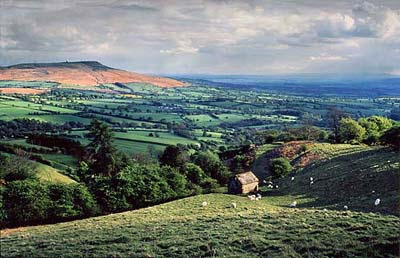 A SHROPSHIRE LAD. Kegan, Paul, Trench, Trubner & Co. Ltd., London, 1896. The value of the book can be traced across the 113 years since publication. The book, in terms of the purchasing power of money, was worth a lot more in the late 1920s than now, although some copies since have made very serious sums. The copy presented to Moses John Jackson made £45,000 in 2001. Moses was the inspiration for the masterpiece. AEH had loved him and was forlorn when he left for India to get married. The relationship between Housman & Jackson is the subject of Tom Stoppard's play, 'The Invention of Love'. Although Housman was a conscientious correspondent, responding to many fans and fellow writers, he seldom inscribed his books. To one collector he wrote '... I am afraid that you have paid an exorbitant price for the first edition of A Shropshire Lad and that you may wish to have it returned to you by registered post.' 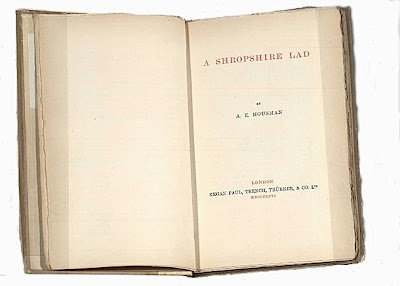 The price of the first edition of A Shropshire Lad, which had only been four pounds in 1919, reached $157.50 (divide by 4 for pounds) in 1923 and, by 1929, $625.00. My earliest Book Auction Records, a volume from 1948 reveals 3 copies in that year making £29 and £16 and £9, in the early 1950s two inscribed copies made $200 and £44. By the 1960s it was making nearly £100 and in 1976 a signed copy with a signed photo & 9 ALs s loosely inserted made a stonking $1200 at Sotheby's New York, with regular copies making $500. By the mid 1990s unsigned copies were making $1000 and in 2002 copies started making over £1000. in January this year at Freeman's USA $2125 was paid for a copy described thus - 'Small 8vo, orig. 1/4 vellum & gray-blue bds; paper spine label, edges untrimmed; extremities discolored. Internally clean. Complete with 1/2 title. With the word "Shropshire" on paper spine label 33 mm wide. With 2 bookplates on front paste-down, incl. Rockwell Kent designed Frederick Baldwin Adams, Jr. book plate. In custom 1/2 morocco & cloth slipcase with red cloth chemise. Presentation copy from Louise Guiney to Rev. William H. Van Allen of Boston. Guiney had writted an enthusuastic (and unsolicited) review of the work for the Chap-Book.' Meanwhile on ABE there are 6 copies, none fine, over £3000, something of a noli tangere price and 5 more between £1200 and £2800. Great post - just a clarification, Housman's 'Praefanda' is actually a journal article, published in the German classical journal Hermes. Not, as far as I know, a separate publication (unless offprints exist, I suppose). Yes, a nice piece many thanks. Remember Orwell's comments on Housman' seeming 'tinkling' and changing tastes? will never really go away. Holy, I feel like crying I found a copy of the book as a bookmark in a re-use center. I loved the storys but to find out its this much. Man now im blubbering. Thank you for this post. It is dated and published by Kegan Paul, Trench, and Co. Ltd., 1896 with whiteish parchment (some call it vellum) spine. The US ed is 1897 and also dated. Good luck but probably not the first edition. I have a copy of "A Shropshire lad", I'd like to know its value if any of you know it, since I am no expert. It is a small book measuring 5 x 3.5,inches, I am not sure of the covering, it is either red leather or a kind of red chemise material, embossed in each corner is a flower which resemble Carnations. On the 3rd inner page it reads: "London E. GRANT RICHARDS 1907. At the back of the book it reads: PLYMOUTH WILLIAM BRENDON AND SON, LTD. PRINTERS. Can anyone tell me if it is rare as I know that this edition is a "Royal 32mo", as stated on the printing edition page. Can anyone help me please.